The Siam Commercial Bank started in January 1906 in the reign of King Rama V as the first local commercial bank in Thailand. This was the brainchild of Prince Mahisara Rachaharuthai, who earned the sobriquet "Father of Thai Banking". Up to this time only foreign banks were operating in Thailand. Since the reign of King Rama IV, (1851 – 1868) when foreign trade and diplomatic relations expanded, paper money, in the form of royal promissory notes, was used for trade. Later bank notes were issued by the foreign banks. In 1888, Hong Kong and Shanghai Bank started the first bank in Thailand and printed the country's first bank notes. Chartered Bank, the forerunner of Standard Chartered Bank, followed later in 1894. By the early 20th century, it was recognized that a sound banking system was crucial for sustained economic development. There was therefore a pressing need to establish a local bank so as not to rely completely on foreign banks. 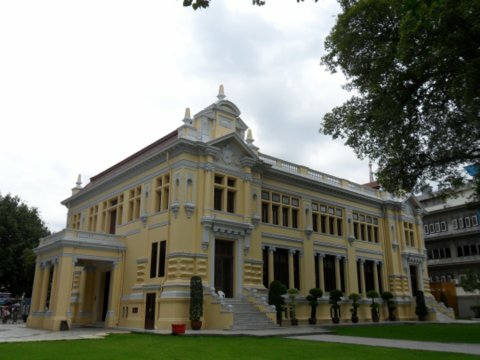 Prince Mahisara Rachaharuthai started the first local bank in 1904, which was curiously called the "Book Club". 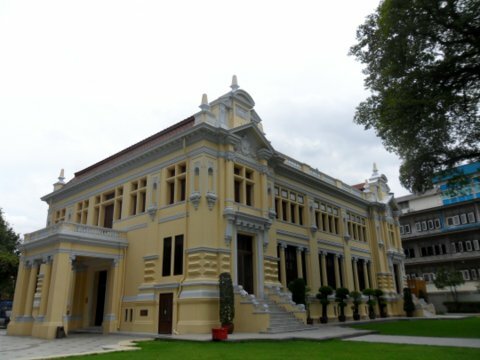 This venture soon gained recognition and on 30 January 1906 King Rama V granted a royal charter to designate the "Book Club" officially as the Siam Commercial Bank. 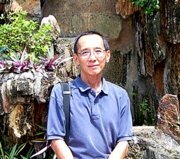 So began the first commercial Thai bank and the foundation for the build up of a local banking system. Italian architect, Annibale Rigotti (1870 – 1968) designed the first branch at Talad Noi on the banks of the Chao Phraya just next to the Holy Rosary Church in Chinatown, Samphanthawong, the old quarter of Bangkok. 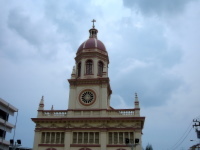 The construction lasted from 1906 – 1910. From its first branch in Talad Noi, the bank has expanded to 750 branches nation-wide,(as at December 2006) the highest in the Thai banking industry. The hallmark purple signs of its branches are present in every district in Bangkok. Its ATM's are in virtually every shopping mall and train station. As at 31 December 2005, bank assets total 807.77 billion baht or US$ 20.71 billion. Besides it long and proud history, the bank has a regal pedigree. The Crown Properties Bureau, the royal investment company, is the main shareholder. Besides His Majesty the King and the Royal Privy Purse also have direct stock holdings. The bank's track record to date is worth noting. In 2005 Business Week magazine listed the bank in the top 150 Leading Asian Companies, the only commercial bank in South East Asia to make the list. In the same year, it was voted the best bank in Thailand by Euro Money, Finance Asia and Asian Banker magazines. On 30 January 2006, the Siam Commercial Bank proudly celebrated its centenary. Captains of industry and finance attended this gala event which was appropriately held at Talad Noi, the bank's first branch and Annibale Rigotti's earliest works in Bangkok. The bank has come a long way since the first branch in Talad Noi in 1906. The Talad Noi branch of the Siam Commercial Bank by the Chao Phraya River just on the outskirts of Chinatown, Samphanthawong district. 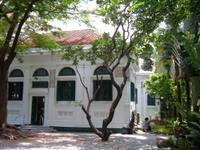 The beautiful 100-year old building, is set in a spacious garden with a private pier on the Chao Phraya River. An easy way to get there is to take the Bangkok skytrain to S6 Taksin Bridge station. From there take a Chao Phraya River boat from the Sathorn Pier to the N3 Si Phraya Pier. From Si Phraya, walk along Soi Wanit 2 till you get to Yotha Road. The SCB Talad Noi branch is on the left, just after the Holy Rosary Church. If you're going by road, go along Charoen Krung Road, past the Si Phraya junction. Take the left fork, cross the canal and turn left into Yotha Road. The Talad Noi branch like all other branches of the Siam Commercial Bank is open from Monday – Friday. To view the building please go during office hours as the gate to the compound might be locked after that. The SCB Talad Noi branch is located on Walking Street that goes all the way through Chinatown. While you are there, drop in to the Holy Rosary Church as well. For the other works of the Italian Architects in Bangkok.